HIGHLANDERS have officially parted ways with one of their senior players, Gabriel Nyoni who is said to be headed for Caps United. Makepekepe have reportedly offered Nyoni a stand in the affluent Harare suburb of Borrowdale, a $1 500 monthly salary and secured him employment in marketing. Nyoni is a holder of a degree in Marketing from the National University of Science and Technology (Nust). Caps United's administrator Morton Dodzo yesterday, however, denied that they have signed Nyoni, stating that they have not even engaged him at all. Dodzo said they were waiting for direction from their coaching department to inform the club administration if they were interested in Nyoni. "We haven't signed Gabriel Nyoni, we haven't even engaged him, and we haven't initiated any talks with him. We haven't seen the coaches' wish list and if that player is part of that,'' Dodzo said. Bosso announced yesterday through their social media platforms that they had failed to reach an agreement with Nyoni who led Bosso for the bulk of the 2018 season. "We would like to announce that after protracted contract negotiations with Gabriel Nyoni, the two parties have been unable to agree on terms. While an agreement had been reached on the basis of the player's tabled terms, the new improved contract offer couldn't be signed,'' read the Highlanders post. Bosso said they respect the player's choice and remain steadfast in their desire to strengthen their squad. "We respect his decision and remain committed to improving the squad and its competitiveness guided by the strong desire to continue crafting a progressive trajectory on the basis of sound economic judgment particularly in these difficult times. Highlanders FC would like to thank Nyoni for his contribution in the years he spent at the club, and wishes him all the best in his future endeavours,'' concluded the Highlanders statement. Kenneth Mhlophe, the Highlanders chairman yesterday confirmed that the contract renewal talks with Nyoni had collapsed and wished the player well wherever he was headed to. He said they could not promise players things they could not afford. Nyoni is understood to have asked Bosso to buy him a house as part of his conditions for agreeing to extend his stay at the club. "He has left, I wish him well, we understand he has signed for Caps United. We failed to agree terms with him, we wish him the best of luck. We couldn't promise him what we could not afford, it's not right. We had no issues with his salary demands, Highlanders could afford it but he also wanted us to buy him a house which we couldn't do,'' Mhlophe said. Yesterday, Nyoni posted on his Twitter timeline "Thank you @HighlanderBosso" and went on to post a 40 seconds video of some of his finest moments with Bosso. "Thank you #Highlanders FC Bosso #Ayisozeibulawe. My association with Highlanders doesn't end here, have always been a Bosso fan and it will remain that way. I played for Highlanders with all my heart,'' he said on Facebook. Nyoni, a speedy winger had his best season ever with Highlanders, which saw him score six goals, finish as the joint Top Goal Scorer with Newman Sianchali. On his 27th birthday on 9 September, "Granvia" scored and provided an assist in a 3-0 drubbing of Dynamos at Barbourfields Stadium. 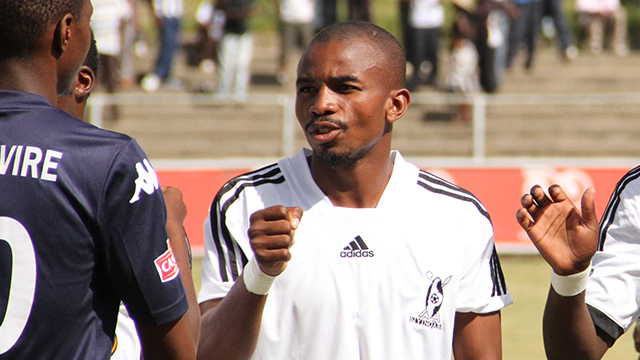 Nyoni joined Highlanders in July 2013 from Bulawayo Chiefs who were then in the Southern Region Division One League. Most Highlanders fans will remember him for the way he celebrated his first Highlanders goal in September 2013 when he took off his short to reveal a black and white boxer short. In July, Nyoni went for trials at Botswana Premiership side, Township Rollers who put forward a laughable P10 000 to sign the player on a permanent basis. Another player Highlanders appear to have lost is defender Peter Muduhwa, who Mhlophe said they had given 24 hours last week to make up his mind on whether he is signing a new contract or not. Muduhwa, an anchorman who has been transformed into a central defender is said to be wanted by 2015 champions Chicken Inn. "Peter Muduhwa is still playing hide and seek with us. He makes promises that he will meet with us which he never fulfils. We gave him a 24 hour ultimatum to decide what he wants to do because the coaches want to plan for next season,'' said the Highlanders chairman. Muduhwa has since 2015 been a permanent feature in the Highlanders first team when former Bosso coach, Bongani Mafu brought him back on loan from Bulawayo Chiefs. In 2016, Muduhwa was voted among the 11 Soccer Stars of the Year.